Jackie (Jack) Carrol Cales, age 86, died at his home in Tonkawa on Saturday, February 23, 2019, after a lengthy battle with congestive heart failure. Friends and loved ones may pay their respects at the funeral home from 4-8pm Wednesday, 9am-8pm Thursday, and Friday from 9am-12pm. The family will be present to greet friends Thursday from 5-6pm. A funeral ceremony to celebrate Jack's life will be held at 2:00 pm Friday, March 1, 2019, at the First Baptist Church in Tonkawa with Pastor Terry Ballard officiating. Casket bearers will be Jack's grandsons. Following the ceremony, Jack will be laid to rest at the Odd Fellows Cemetery in Ponca City. Jack was born on October 19, 1932, in Ponca City to parents Carrol and Mildred Evatt Cales. He attended public schools in Tonkawa and Burbank, before graduating from Tonkawa High School in 1950. He then attended college at Northern Oklahoma Junior College, Oklahoma Baptist University, and Oklahoma State University where he earned a B. S. in business in 1954 and an MS in 1973. In 1954 he was drafted into the U. S. Army and served nearly two years stationed in the territory of Alaska. In 1954 he also married Wanda June Rice. Before that marriage ended, they had two children, Stewart Craig and Cynthia Dianne. On Valentine's Day, 1969, he proposed to Anna Colleen Polk. They married on June 6, 1969, and moved to New Jersey for work, returning to Oklahoma the following year. Together, they had one daughter, Diana Rachelle. Jack came from a family that had a strong work ethic. He found great satisfaction in work, whether it was in the family farming business and working the Case Implement Dealership, or doing taxes for others in his own accounting office. For six years he worked for Conoco and was transferred to Saddlebrook, New Jersey, to manage an accounting unit. The death of Jack's father, brought changes in his responsibilities when he resigned from Conoco to manage some of the farming and ranching interests. For years, elk hunting was a favorite fall sport with his cousins and friends, but most of his free time was spent with family. He loved traveling, camping, and traveled over most of the United States and part of Canada in a pop-up tent trailer with the family. The family also traveled to Europe, to England and Scotland, and Israel. In 1991, Jack bought a rustic cabin in Platoro, Colorado, which he and family members repaired, cleaned, restored in that high mountain valley. It became a beloved second home for over 25 years, bringing the family much joy, recreation, and life-long friendships in a beautiful part of Colorado. At an early age, Jack had given his life to Jesus and had joined the First Baptist Church. 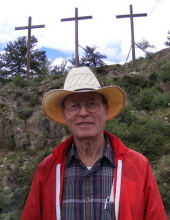 For nearly 20 years he served the church as volunteer treasurer. Later he assumed teaching duties for the men's Sunday school class and taught that Bible class until 2018. Jack was preceded in death by his parents, brother Don Cales, grandson, Chase Jeffrey Larmer, daughter-in-law Linda Cales. He is survived by his wife, Ann Cales of the home; his son, Stewart Cales of Ponca City; his daughter, Cindy (and husband Jeff) Larmer of Ponca City; his daughter, Diana (and husband Joe) McGee of Eldorado, TX. Also eight grandchildren--Jason (and wife Angie) Cales of Bartlesville, Eric Cales, Callie (and husband Jeremy) McBride, all of Ponca City Reese Larmer of Oklahoma City, Benjamin McGee, Jonathan McGee, Andrew McGee, and Micah McGee all of Eldorado, TX. And four great grandchildren--Abigail Cales, Hunter Cales, Sage Cales, Gage Cales. In lieu of flowers, memorial donations may be made to the First Baptist Church Benevolence Fund, 212 N. Main St., Tonkawa, OK 74653. Arrangements are under the direction of Trout Funeral Home &Cremation Service of Tonkawa. To send flowers or a remembrance gift to the family of Jack Cales, please visit our Tribute Store. "Email Address" would like to share the life celebration of Jack Cales. Click on the "link" to go to share a favorite memory or leave a condolence message for the family.